"We are very pleased to forge this in-depth partnership with DuPont. 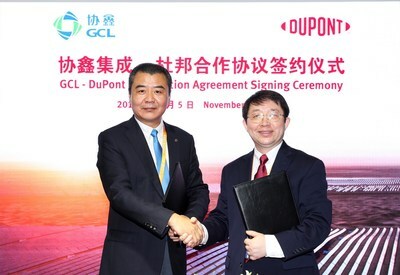 The DuPontâ„¢ Tedlar ® PVF film has always been the prime choice for our modules and I'm confident that our cooperation will further enhance the quality, performance and reliability of our products," said Xin Luo, Chairman of GCL-SI. According to Wang, more than half of the world's solar panels installed since 1975 have DuPont materials in them. DuPontTM Tedlar ® film-based backsheet is the only backsheet material proven to protect solar panels for over 30 years in all weather conditions with an aim of maximizing durability and reliability and minimizing system defects.